From a woman to motherhood, pregnancy is a special journey in life. One which not only comes with a growing belly but many other significant physiological changes and demands as the body prepares for a new life to grow and be nurtured. This 40 week journey is divided into 3 trimesters which starts from the first day of your last normal period. • Improved cardiovascular function and physical fitness. 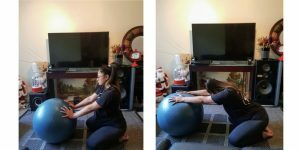 Pregnant women who were previously active should aim to engage in submaximal resistance training twice a week and 150 minutes of moderate intensity or 75 minutes of vigorous intensity aerobic exercise. If possible you can do a combination of both per week. If you have been sedentary prior to pregnancy, it is important to start with lower intensity exercise and gradually progress as advised by a qualified health professional. Stretching is a form of light physical activity which allows your body to temporarily lengthen targeted muscles and reduce feelings of tension in the body. Not only is it good preparation for labour but helps with improving flexibility and alleviating feelings of aches and pains. Remember not to overstretch into pain and not to stretch further than you could prior to pregnancy. As certain pregnancy complications might make exercise dangerous ensure to seek approval from your doctor and health care team before engaging in exercise. Start with your toes together and knees as wide as comfortable, hands on the swiss ball or on the floor in front. 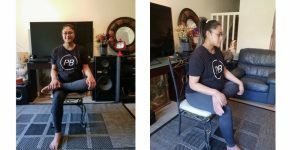 Inhale, sit your hips back toward your heels. Exhale, tuck your head toward your knees and melt your chest down whilst keeping your arms extended forward. Hold stretch for 3 slow controlled diaphragmatic breathes and return to the start. Gradually work your way to 10 repetitions. Start on your hands and knees, keeping your elbows straight, hands beneath your shoulders and head in line with your back. Kneel on your right knee and put your left foot in front of you to form a 90degree angle. Keep your back straight, lean forward and shift your weight to the front leg to feel the stretch in the right thigh and hip. Hold for 30 seconds, then switch legs and repeat 2-3 times. 1. Sit on a chair with feet flat on the floor. 2. To stretch your left side, pull your left ankle onto your right knee. 3. Keep your back straight, lean forward until you can feel the stretch around your left hip. Hold for 30 seconds, switch legs and repeat 2-3 times. 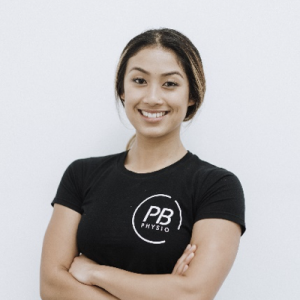 Julia Hlaing is the Senior Musculoskeletal Physiotherapist & Women’s Health Physio at PB Physio. 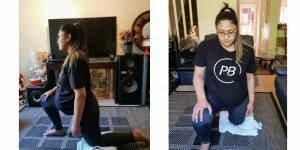 She helps women with incontinence , post natal, pre natal, pelvic pain, and also assist with clients for sports, and performance specifically strength athletes. American College of Obstetricians and Gynecologists. Physical activity and exercise during pregnancy and the postpartum period. Committee Opinion No. 650. Obstet Gynecol. 2015;126:135-142. Kader M, Naim-Shuchana S. Physical activity and exercise during pregnancy. Eur J Physiother. 2014;16(1):2-9. Nascimento S, Surita F, Cecatti J. Physical exercise during pregnancy: a systematic review. Curr Opin Obstet Gynecol. 2012. Soma-Pillay, P., Nelson-Piercy, C., Tolppanen, H., & Mebazaa, A. (2016). Physiological changes in pregnancy. Cardiovascular journal of Africa, 27(2), 89-94.